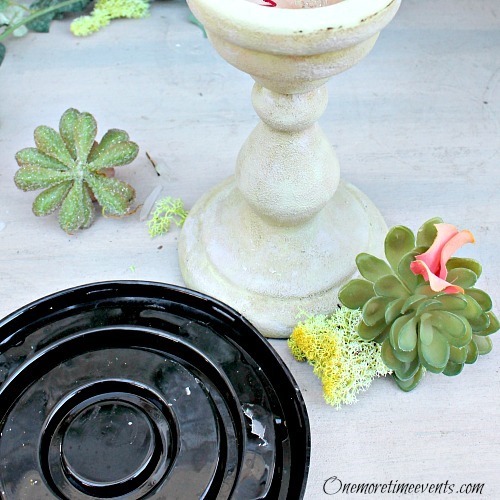 Budget Wedding Table Centerpieces do not have to look cheap! 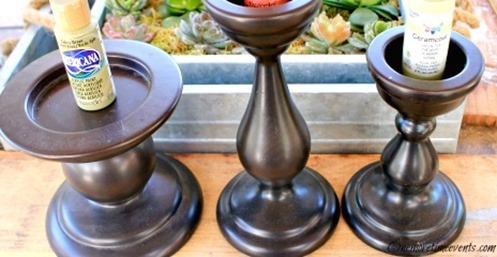 Here’s a howto tutorial for beautiful nearly-free centerpieces. 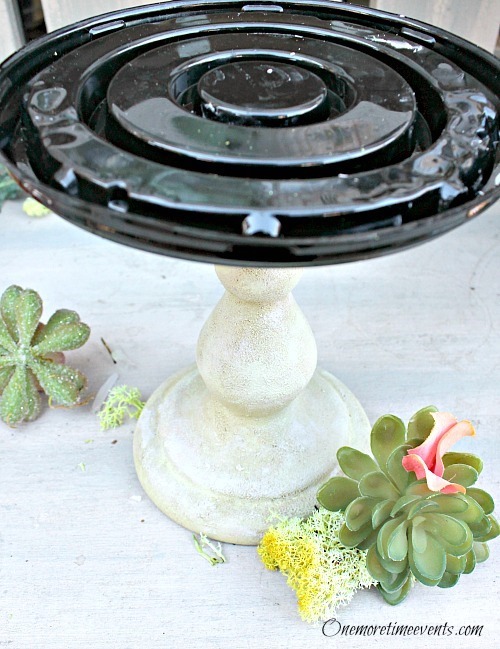 Hi, Fine Craft Guild readers… I am excited to share with you another recycled project. 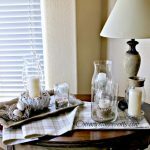 Most of my projects have been done with glass and my last one was done on how to use your beverage recycled bottles to create a summer centerpiece. 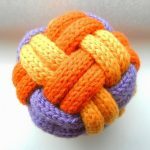 Today I would like to share with you another way to use your food item containers …only this one is done with plastic. With Summer, comes summer weddings. We all know weddings can be very expensive. Flowers – table centerpieces for the guest tables can add up to quite a lot of money . 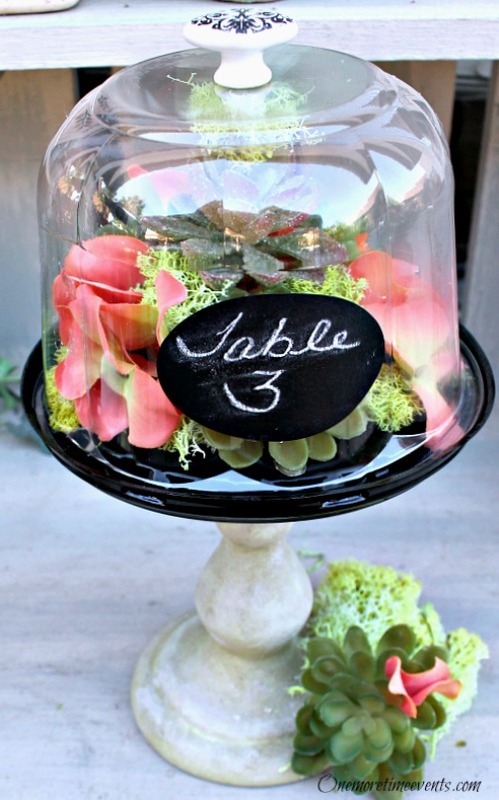 Here is one way you can create a wedding table centerpiece from either recycled plastic domes… You know, the ones you get when you purchase a individual cupcake or cake from the grocery store? 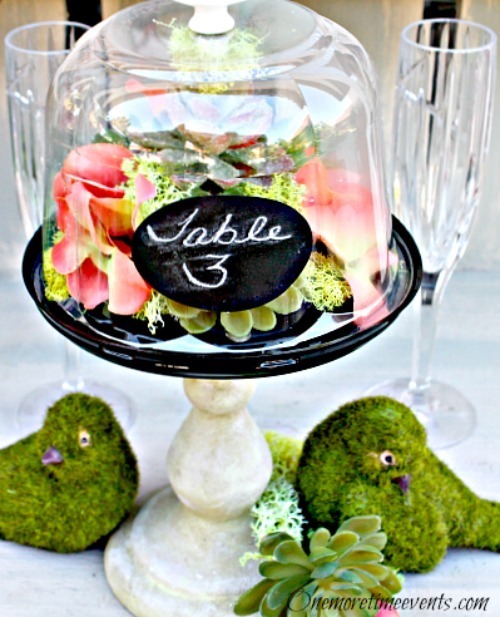 Or, if you look around, you can purchase 25 for around $11.00… That is enough to decorate many Wedding guest tables. 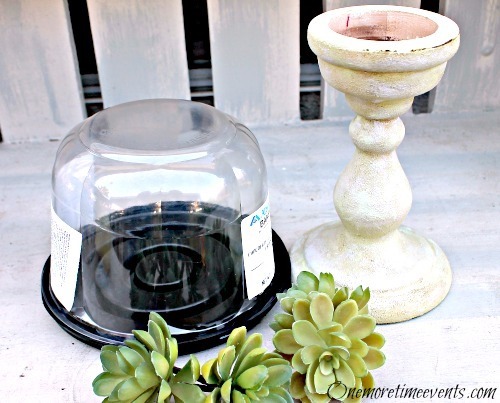 Also, using candle sticks this will create the pedestal for your decorative dome, which can be found at thrift stores for almost next to nothing, with a little paint to match the colors of your wedding. 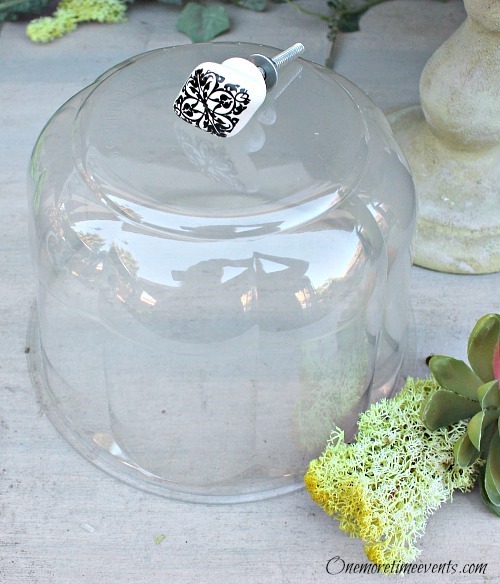 Taking the bottom portion of the dome container, fill it with your choice of flowers…. 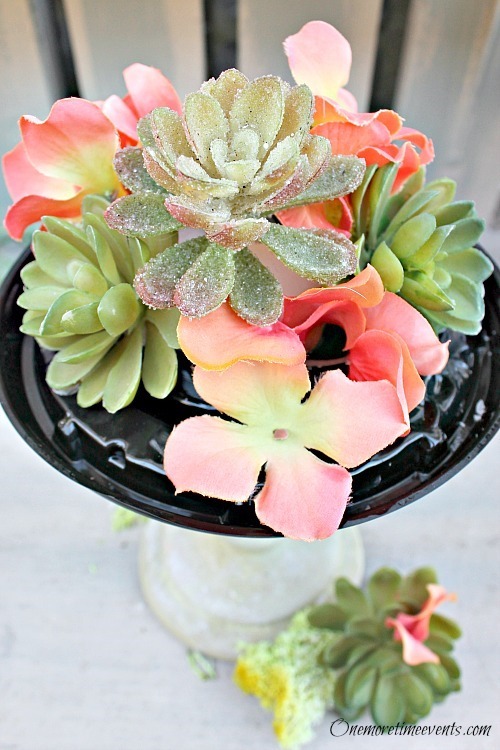 Here I used silk coral flowers and some faux succulents, which has taken front and center stage instead of flowers. 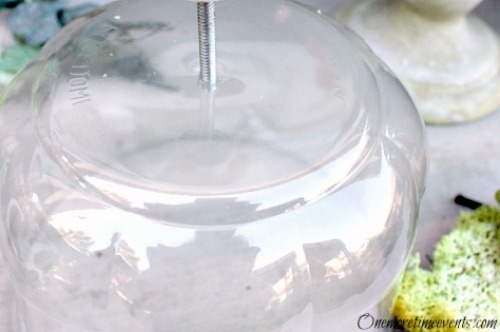 Adding a decorative knob to the top of the clear plastic dome by poking a hole in the center and inserting your knob. 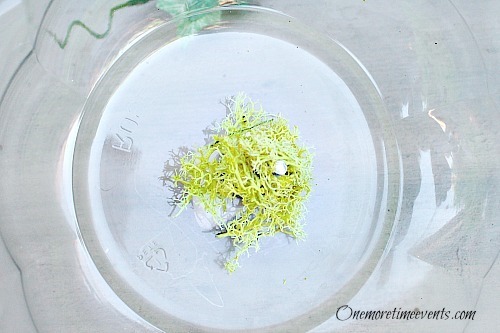 To cover the screw, take a piece of moss and wrap it around the screw. 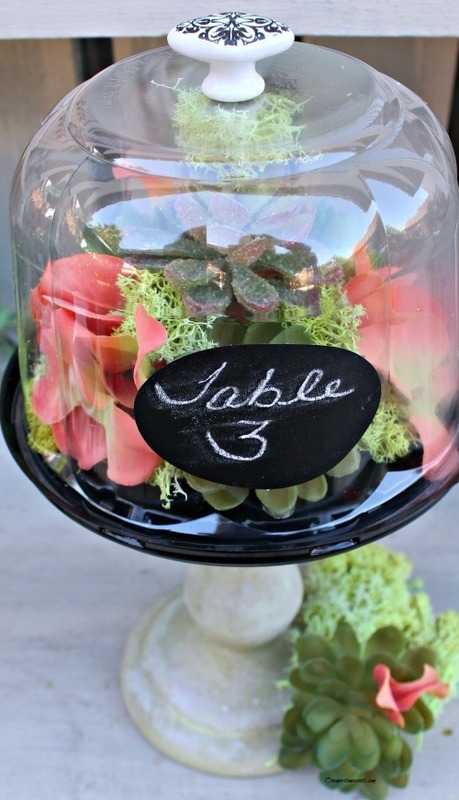 Vinyl chalkboard label stickers are perfect for numbering your table centerpiece. Simply take a piece of chalk and writer the table number, peel center on dome … You’re done! Tammy enjoys the challenge of reinventing her décor. She’s great at figuring out how to make something out of ‘nothing’. To her, ‘left-overs’ have a purpose. She has an urge to recycle |reuse | revamp | redecorate | remodel. And she does so, creatively, beautifully and naturally. Her works shows her love for decorating. 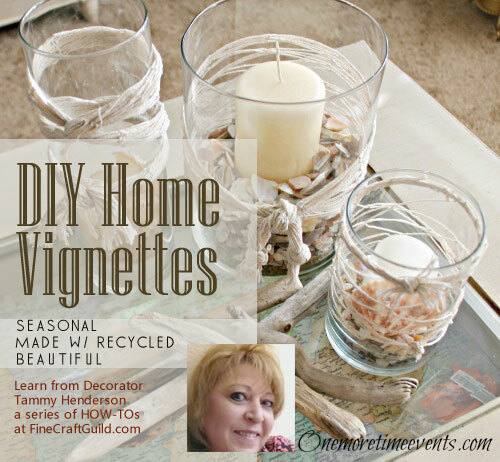 Tammy is the living proof that decoration with what you have | recycled materials, plus maybe a small budget for craft supplies, can create beautiful results. When you walk through her house and her garden, as displayed in her blog, you see a tastefully decorated place that has personality and a sense of home. 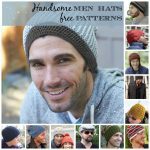 Tammy used to own a retail scrapbooking business and her blog is that ‘One More Time’ love affair with the creative world. 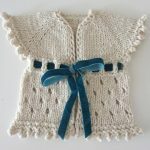 While her emphasis at ‘One More Time’ blog is on decorating, at the FineCraftGuild she shares her how-to’s and gives us more than a little peak on how things are put together. And yes, all of these beautiful photos above are all hers!